Coronary-subclavian steal syndrome results from atherosclerotic disease of the proximal subclavian artery, causing reversal of flow in an internal mammary artery used as conduit for coronary artery bypass. In the present case, we discussed the diagnosis and the treatment of coronary steal syndrome in a patient hospitalized due to decompensated cardiac insufficiency. The development of proximal subclavian stenosis may lead to reversal of flow from the left internal mammary artery (LIMA) to subclavian artery resulting in coronary artery disease known as coronary-subclavian steal syndrome (CSSS). This rare complication of cardiac revascularization leads to recurrence of myocardial ischemia. When feasible, subclavian angioplasty and/or stent placement can provide acceptable result for these patients. Vascular reconstruction through carotid to subclavian artery bypass has been the standard procedure of choice. Other interventions in literature include axilloaxillary bypass and subclavian carotid transposition. The use of LIMA is recommended as a coronary bypass graft due to its excellent long-term results. Besides, CSSS might be seen depending on stenosis in proximal subclavian artery and escape of the flow back to the subclavian artery from LIMA. This case report describes the use of carotid-subclavian artery bypass for the treatment of CSSS. A 54-year-old male was admitted to our hospital with complaints of severe dyspnea, inability to lie in supine position, decrease in effort capacity, and pain in the left arm. Physical examination revealed tachycardia and 3/6 apical systolic murmur; bilateral rales in lower lung zones. Brachial, axillary, and radial pulses of the left arm were not palpable but were clearly palpated over the right arm. Lower extremity pulses were palpable. Past medical history revealed that he underwent coronary bypass graft operation five years prior to presentation. He was assessed to have New York Heart Association Functional Classification Class III-IV, with a clinical diagnosis of ischemic cardiomyopathy (CMP), decompensated heart failure. An echoacradiogram was performed which showed increased left ventricular diameter and left ventricular ejection fraction of 18% by the modified Simpson method. He was started on diuretic and vasodilator treatment with regression of failure symptoms. However, he continued to have symptoms of angina and left arm pain responsive to isosorbide dinitrate. A differential diagnosis of CSSS was considered and patient underwent coronary angiography. It was observed on coronary angiography that point of origin of the left subclavian artery in the aorta was totally congested beginning from approximately 1 cm proximal [Figure 1]. A vertebral artery angiography was showed subclavian in bridge collaterals and flow to LIMA were observed in late period. Using a ringed polytetrafluoroethylene (PTFE) graft (Vascutek, Germany) with a diameter of 6 mm, a left carotid-subclavian bypass was performed on the patient in elective conditions. Carotid shunt was not used while systemic heparin (5000 units) was administered during the operation. Postoperatively, a good graft pulse was felt in addition to easily palpable left upper extremity pulses. There were no complications. Following the operation and in the postoperative period, the complaints of the patient related to chest pain, dyspnea, and left arm pain progressively decreased. The patient was discharged on the postoperative day 5. 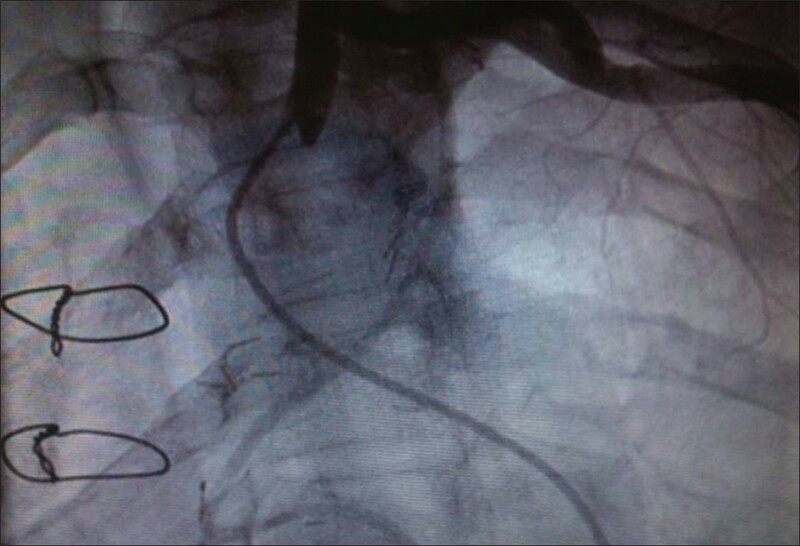 Control coronary-subclavian angiogram 1 month later revealed an intact PTFE graft between carotid and subclavian artery [Figure 2]. In our case, the patient developed symptoms more than 5 years after coronary artery bypass graft (CABG). Since the stenosis was very close to the vertebral artery, there was a risk of occlusion during stenting. Therefore, bypass grafting was chosen in preference. Carotid-subclavian artery bypass is considered the standard surgical treatment for symptomatic occlusion of proximal subclavian artery. , However, preparing an atherosclerotic subclavian artery in our patient for anastomosis was not feasible. In addition, exposure of the subclavian artery and bypass grafting to it through supraclavicular approach is not without technical difficulty, especially with the close proximity to important lymphatic channels and nerves. On the contrary, infraclavicular exposure of the axillary artery is a straightforward technique routinely performed by vascular surgeons and eliminates some of the potential risks of supraclavicular approach. CSSS should be considered in patients presenting with recurrent chest pains after CABG with in situ left internal mammary grafts. Surgical extra-anatomical bypass is an effective method of treating this uncommon condition when percutoneous transluminal angioplasty is not possible. In experienced hands, carotid subclavian artery bypass remains the standard surgical procedure of choice. Carotid axillary artery bypass can be a feasible alternative when the traditional procedures are technically difficult. 1. Guidelines and indications for coronary artery bypass graft surgery. A report of the American College of Cardiology/American Heart Association Task Force on Assessment of Diagnostic and Therapeutic Cardiovascular Procedures (Subcommittee on Coronary Artery Bypass Graft Surgery). J Am Coll Cardiol 1991;17:543-58. 2. Takach TJ, Reul GJ, Cooley DA, Duncan JM, Livesay JJ, Ott DA, et al. Myocardial thievery: The coronary-subclavian steal syndrome. Ann Thorac Surg 2006;81:386-92. 3. Kern KB, Warner NE, Sulek CA, Osaki K, Lobato EB. Angina as an indication for noncardiac surgery: The case of the coronary-subclavian steal syndrome. Anesthesiology 2000;92:610-2. 4. Munk PS, Larsen AI, Fjetland L, Nilsen DW. Acute occlusion of the left subclavian artery causing a non-ST-elevation myocardial infarction with subacute lung edema due to a coronary subclavian steal syndrome: A case report. Int J Cardiol 2006;108:139-41. 5. Paraskevaidis SA, Giavroglou KE, Proios TD, Saratzis NA, Louridas GE. Stent implantation at subclavian artery in a patient with left internal mammary graft and subclavian steal syndrome. Hellenic J Cardiol 1997;38:310-5. 6. Tan JWC, Johan BA, Cheah FK, Wong P. Coronary subclavian steal syndrome: A rare cause of acute myocardial infarction. Singapore Med J 2007;48:5-8. 7. Pappy R, Kalapura T, Hennebry TA. 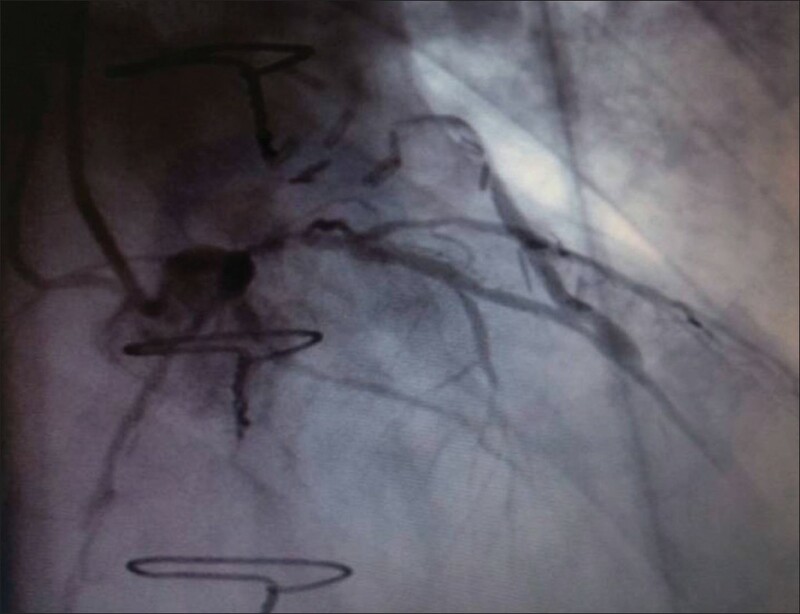 Anterolateral myocardial infarction induced by coronary-subclavian-vertebral steal syndrome successfully treated with stenting of the subclavian artery. J Invasive Cardiol 2007;19:E242-5. 8. Ziomek S, Quinones-Baldrich WJ, Busuttil RW, Baker JD, Machleder HI, Moore WS. The superiority of synthetic arterial grafts over autologous veins in carotid-subclavian bypass. J Vasc Surg 1986;3:140-5. 9. Celkan MA, Daglar B, Kazaz H, Dinckal H. Symptomatic coronary-subclavian steal syndrome due to total occlusion of proximal left subclavian artery. Interact Cardiovasc Thorac Surg 2003;2:534-6.